Wei Shen's long-time friend Dr. Tang has created the ultimate vehicle to turn the tide of the turf wars: a fully weaponized supercar. Wheels of Fury, the latest DLC for Square Enix's Sleeping Dogs is out now for PC, PS3 and Xbox 360. The DLC includes five story missions that center around the DZS-90 weaponized supercar, which can be upgraded multiple times with new weapons and features. The DLC will set you back 320 Microsoft Points on Xbox 360, or $3.99 on PC or PS3. In Wheels of Fury, Dr. Tang, a long-time friend of our hero Wei Shen, is working on inventions to help thwart the Triad in Hong Kong. The DZS-90, a James Bond-esque gadget-packed supercar, is his latest creation, and he employs Shen to help him test and upgrade it. The DZS-90 in its final form includes twin, concealed roof-mounted machine guns, 4-wheel steering, an electro-magnetic pulse, and boosted speed and armor. Q, or at least, Pierce Brosnan-era Q, would be proud. 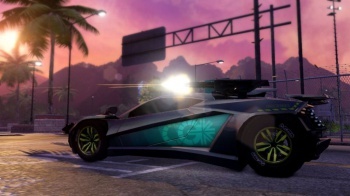 The DLC's missions have Shen search Hong Kong for parts to upgrade the car with, while avoiding the 18k who are keen to get their hands on the vehicle to use it as a drug-runner. Once you've finished all five of the DLC's missions, you'll unlock the DZS-90 in your garage to use with any of the main Sleeping Dogs missions that allow you to bring a car, with several "secondary activities" that are included in the DLC, or just to cruise around Hong Kong shooting at pedestrians. The DZS-90 has access to the police scanner, so Shen can hear what's happening around the city. Unfortunately, since it's still a prototype, it may occasionally malfunction, picking up the private phone conversations of some of Hong Kong's citizens. It should make for some interesting listening material for those of you who have had enough of the stock radio. New collectibles scattered throughout the city will unlock new vehicle skins, and there are also two new driving challenges to complete. While not quite as long or substantial as Nightmare in North Point or The Zodiac Tournament, Wheels of Fury does come in at a much lower price point. It has slightly more content than an average "new items" style DLC pack (such as the Law Enforcer Pack or all the pre-order bonus DLC), and actually has a little story to tie it all together. For those of you hungry for more Sleeping Dogs, it's a nice little piece of content to tide you over until the next big story-driven DLC, Year of the Snake, comes out in March.